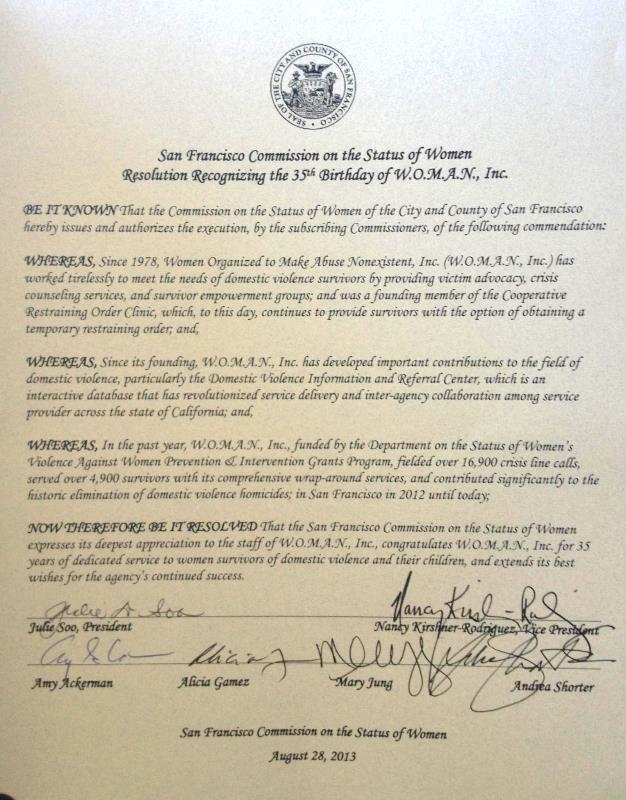 San Francisco Commission On the Status of Women Congratulates W.O.M.A.N., Inc. For 35 Years of Dedicated Service – W.O.M.A.N., Inc. Though the faces have changed over the years – from all of us who have ever served at W.O.M.A.N., Inc. as a board member, staff member, or volunteer, many thanks for recognizing our 35 years of dedicated service to survivors of domestic violence and to strengthening the anti-violence field in general. W.O.M.A.N., Inc. appreciates all the support we have gotten from the community over the years. If you would like to help us continue our work with survivors, please consider giving today on our secure donation page. Tagged 35, commission, cosw, resolution, status, W.O.M.A.N.